Plate fifteen from '24 Views in Indostan by William Orme'. This picture is based on an original by Thomas Daniell (1749-1840). 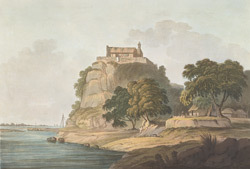 The town of Dalmau is situated on a steep cliff overlooking the River Ganges. The fort at Dalmau contains buildings dating to the the rule of the Mughal Emperors Akbar and Shah Jahan (late16th to mid 17th Century).